So you are a student interested in a career in science, technology, engineering, or mathematics (STEM). What is the job market going to be like when you graduate? Total Jobs—new jobs plus job openings to replace people who have retired. As you can see from the chart on the left, the US government predicts that the four top STEM jobs with the most growth will all be in computing. No other area is expected to generate even 4000 new jobs per year. By contrast, the US-BLS predicts there will be nearly 20,000 new software development jobs, nearly 12,000 new systems analysts jobs, over 8,000 new computing support jobs, and over 4,000 network/system administration jobs. The chart on the right shows that even when retiree replacements are considered, the top four careers with the most job opportunities remain the same: software development, systems analysts, computing support, and network/systems administration. The chart on the right does indicate that there will be some jobs in non-computing STEM areas; most of those jobs will be replacing retiring baby boomers, not new jobs created by economic growth. For the foreseeable future of science, technology, engineering, and mathematics jobs in the US, more 3 out of 4 new job openings and nearly 3 out of 5 total job openings are going to be in computing! It is worth mentioning that this is not a fluke—all of these numbers are fairly consistent with those from two and four years ago. What kind of "computing" careers are these? The bar-chart to the right of each pie-chart breaks down the "computing" job openings into the different career categories, and shows the variety of careers that are available for students who study computing. As can be seen in the chart on the left, the US-BLS is predicting that 31% of the new STEM jobs will be in software development (aka software engineering) alone as compared to 11% in the combined branches of traditional engineering! With respect to total jobs, the chart on the right predicts that there will be nearly as many openings in software development as there will be in all the branches of traditional engineering combined. One reason is the mobile computing market. It used to be that every company wanted a website (and they still do), creating demand for web developers. But today, most companies also want native apps for the iPhone and iPad (which run Apple's iOS operating system) and for all the phones and tablets running Google's Android operating system, creating a huge demand for software developers. Another reason is that manufacturers are increasingly embedding computers into appliances like refridgerators, ovens, water heaters, and so on; creating the so-called Internet of Things. All of these embedded computers will require software to do anything useful, creating even more demand for software developers. These computers will send data across the Internet, and this data will be stored in databases, creating demand for networking professionals and database administrators. When things go wrong, people will need technical support, creating demand for support specialists. Together, these are creating a huge demand for people with advanced computing skills, especially in software development. Note that basic computer literacy (i.e., knowing your way around Microsoft Windows, Word, Excel, or Powerpoint) or CAD-design skills will not qualify you for one of these jobs. Most of these jobs require advanced computing skills that you will only gain by studying computer science, information systems, and/or software engineering. In his 1993 book Outliers, Malcom Gladwell argued that anyone who practices a skill for 10,000 hours can master that skill. If that is true, then it follows that if (for example) you want to prepare yourself for one of those numerous careers in software development, your best strategy is to choose a college major that will give you lots of practice actually developing software. 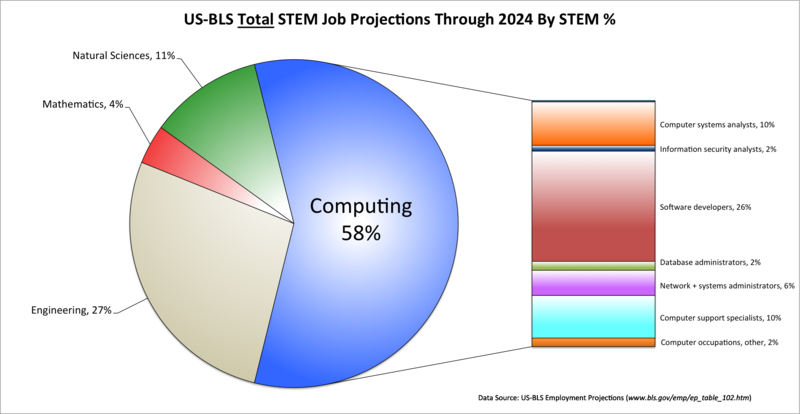 More generally, the US-BLS projections tell us that most of the STEM careers are going to be in computing. If you want to maximize your chances of success in one of these careers, choose a computing-related major that provides lots of hands-on practice in that area. However, employers also place high value on communication, collegiality, being able to work in groups, and other "soft" skills. To maximize your career opportunities, choose a college or university that will help you develop these skills. A liberal arts education is especially good at this. In the 21st century, computing technology (especially software) affects more and more of our day-to-day lives, and people are needed to create and maintain that technology. If you want the best possible preparation for the vast majority of tomorrow's STEM careers, the smart move is to major in a computing-related discipline (computer science, information systems, and/or software engineering) at a college or university that will also help you develop your "people skills". all in the context of a comprehensive liberal arts education. If God has gifted you with creative, logical, and/or quantitative abilities, He may be calling you to a career in computing. We invite you to join us -- we will do everything we can to help you explore that calling and develop your gifts. There are lots of myths about computing careers. One of the most ridiculous is the myth that computing careers are somehow "unsafe", while other science, technology, engineering, and mathematics (STEM) jobs are "safe". While the future is always tricky to predict, let's see what the best available data has to say about what careers are "safe" vs. "unsafe". 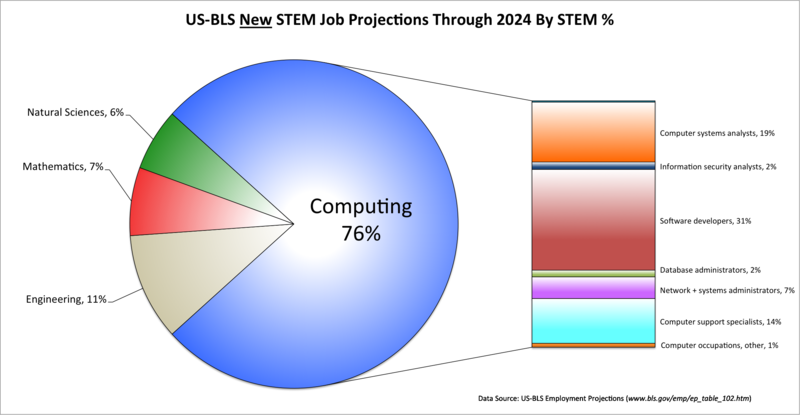 As you can see from the chart on the left, the US government predicts that the STEM jobs with the most growth will all be in computing; only one other area (civil engineering) is expected to generate more than 5000 new jobs per year. By contrast, the US-BLS predicts there will be over 22,000 new software development jobs, over 12,500 new systems analysts jobs, and over 11,000 new computing support jobs. The US-BLS also predicts good growth in the number of computer security analysts, programmers, and network and system administrators. In light of the chart on the left, the chart on the right indicates that there will be some jobs in non-computing STEM areas, but that most of those jobs will be replacing retiring baby boomers, not new jobs created by economic growth. For the foreseeable future of science, technology, engineering, and mathematics jobs in the US, nearly 3 out of 4 new job openings and 3 out of 5 total job openings are going to be in computing! It is worth mentioning that this is not a fluke—all of these numbers are fairly consistent with those from from two years ago. What kind of "computing" careers are these? 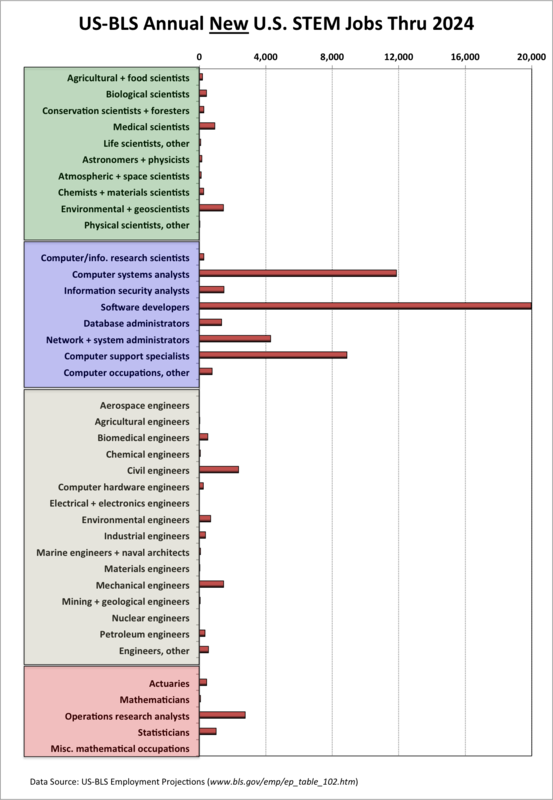 The bar-chart on the right breaks down the "computing" job openings into the different career categories, and shows the variety of careers that are available for students who study computing. As can be seen in the chart on the left, the US-BLS is predicting that 32% of the new STEM jobs will be in software development (aka software engineering) alone as compared to 16% in the combined branches of traditional engineering! With respect to total jobs, the chart on the right predicts that there will be nearly as many openings in software development as there will be in all the branches of traditional engineering combined. Why will there be so many software development/engineering jobs? One reason is the mobile computing market. It used to be that every company wanted a website (and they still do), creating demand for web developers. But today, most companies also want native apps for the iPhone and iPad (which run Apple's iOS operating system) and for all the phones and tablets running Google's Android operating system, creating a huge demand for software developers. Note that basic computer literacy (i.e., knowing Microsoft Word, Excel, or Powerpoint) or CAD-design skills will not qualify you for one of these jobs. Most of these jobs will require advanced computing skills that you will only gain by studying computer science, information systems, and/or software engineering. So the demand for computing-related professionals is exploding, but until recently, fewer students have been choosing to study the subjects needed to pursue these careers. And while more students have been studying computer science since 2009, the supply of CS graduates is still just a fraction of the demand for them. The yellow bars indicate the total number of job openings projected in each area per year, and the orange bars indicate the current number of graduates in those areas. In engineering, the sciences, and mathematics, the US is producing more graduates than there are jobs. If graduation levels remain the same, this means the graduates from these programs will be competing for the available jobs, which tends to keep salaries flat. But in computing, there is a huge undersupply of graduates. As in any situation where demand exceeds supply, companies are competing for the (relatively few) available graduates that have advanced computing skills, driving salaries up. This is creating a huge demand for people with modern computing skills, as they have a wealth of job openings and career options from which to choose. This huge demand is already happening, as evidenced by the "insane" salaries some Silicon Valley companies are paying their interns! In short, these companies are competing for a scarce resource -- people with advanced computing skills -- while non-computing STEM grads are competing for a different scarce resource -- jobs in their discipline. Here in west Michigan, things are not quite so "insane", but in a typical week, we do receive multiple requests from companies or individuals seeking student interns. These include both full-time positions and (mostly paid) student internships. The average wage for the paid internships is about $15/hr. So why is computing the "safe" career option? Because in the 21st century, computing technology (especially software) controls much of our day-to-day lives, and people are needed to create and maintain that technology. a distinctively Christian approach to computer science. If God has gifted you with creative, logical, and/or quantitative abilities, He may be calling you to a career in computing. We invite you to join us—we will do everything we can to help you explore that calling and develop your gifts. outsourcing, that is, sending work to a different company. offshoring, that is, sending work to a different country. Since many companies are outsourcing their software development, this creates the false impression that those companies are sending that work overseas. As the preceding chart indicates, the majority of the outsourced work is staying here in the U.S., and the indications are that the number of computing jobs will continue to grow faster than most other sectors. As you can see, the US government is predicting that the five fastest-growing STEM jobs will all be in computing; only one other area (civil engineering) is expected to generate more than 5000 new jobs per year. By contrast, the US-BLS predicts there will be over 31,000 software engineering jobs, over 12,000 systems analysts jobs, 11,000 computing support jobs, and over 9,000 network/systems administration jobs, and over 6,000 computer security, web developer, or network architect jobs, each year. For the foreseeable future, nearly 3 out of 4 new science, technology, engineering, or mathematics jobs in the U.S. are going to be in computing! By contrast, just 16% will be traditional engineering jobs, and even fewer will be in the sciences or mathematics. What kind of "computing" jobs are these? 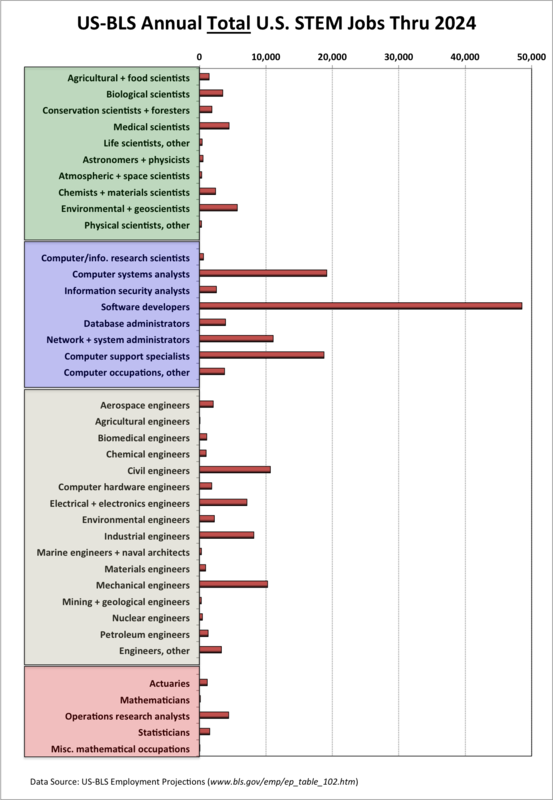 The bar-chart on the right breaks the "computing" jobs down in the different career categories, and shows the variety of careers that are available for students who study computing. As can be seen, the US-BLS is predicting that 30% (314,600) of the new STEM jobs will be in software development (aka software engineering) alone as compared to 16% (178,400 jobs) in the combined branches of traditional engineering! Why so many software development/engineering jobs? In a nutshell, the reason is the mobile computing market. Every organization wants apps for the iPhone and iPad, which run Apple's iOS operating system, and for all the phones and tablets running the Android operating system. These organizations also want a modern web presence, which requires web development and database expertise. Together, these are creating a huge demand for people to build and maintain those apps, websites, and databases. Note that basic computer literacy (i.e., knowing Microsoft Word, Excel, or Powerpoint) or CAD-design will not qualify you for one of these jobs. These jobs require advanced computing skills in modern software development that you will only gain by studying computer science, information systems, and/or software engineering. So the demand for computing-related professionals is exploding, but until recently, fewer students have been choosing to study the subjects needed to pursue these careers. As a result of this supply-demand imbalance, salaries for these professionals are climbing. To see current ranges, check out these salaries for software developers, database administrators, web developers, and systems analysts, which U.S. News & World Report ranked as its #1, #2, #3, and #4 Best Science and Technology jobs for 2012. The yellow bars indicate the total number of job openings projected in each area per year, and the orange bars indicate the current number of graduates in those areas. In engineering, the sciences, and mathematics, there are more graduates than there are jobs. If graduation levels remain the same, this means the graduates from these programs will be competing for the available jobs, which tends to keep salaries flat. But in computing, there is a huge undersupply of graduates. As in any situation where demand exceeds supply, companies are competing for the (relatively few) available graduates that have advanced computing skills, driving salaries up. This is creating a "perfect storm" for people with degrees in computing-related fields, as they have a wealth of career options from which to choose. It is worth mentioning that these numbers are fairly consistent with those from from two years ago. These include both full-time positions and (mostly paid) student internships. The average wage for the paid internships is about $15/hr. As can be seen from the ascending trend line, the average number of requests received by our department has grown to the point that, as of March 2012, it is approaching 4 requests per week, with the majority of these requests being for software developers or web developers. Moreover, this growth in demand has continued through the "Great Recession" of 2009 and 2010. If God has gifted you with creative, logical, and/or quantitative abilities, He may be calling you to a career in computing. We invite you to join us—we will do everything we can to help you explore that calling.